This mod changes the game start. It adds a new event, that drop a different spaceship parts on the landing site from the sky. Pods with colonists, containers with resources, engines with flammable fuel, and other useful and dangerous things. This event triggers at the start of the game, so your arrival will be much more similar to the movie crash landing. With the fire, explosions, dead and wounded people. You will need to organize the rescue of wounded colonists and supplies. The fire will be your main enemy. It will start as small fires on the impact tiles, but quickly grow in major fire. Beat the small fires or evacuate supplies. Watch out for other dangers. This mod tries to add a new gameplay, when you need to choose between resources and wounded peoples. And may be between wounded and maimed. In Easy scenario, you start with 3 healthy colonists and standard equipment. While some more random colonists will be crash-landing hard with little chance of surviving the impact. 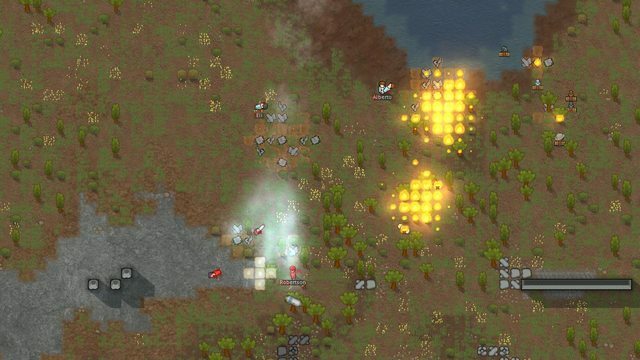 In Hard scenario, your starting colonists and equipment will crash land and take severe damage. Then, some more random colonists will be crash-landing hard with little chance of surviving the impact. You should start the new game only with one of the CrashLanding scenarios. Otherwise you will have no CrashLanding, only random ship crashes as minor events. If you you make new scenario by editing CrashLanding scenarios, it will have crashlanding event at the start. That mean, you can add various scenario parts through in-game editor, without breaking CrashLanding. Since you can create your own scenario by editing one of the crashlanding scenarios, you need to delete all such scenarios manually, before uninstalling the crashlanding. Otherwise the game fails to start any new game. - Should be savegame compatible. - Prisoner apparel storage fix. - Balance: Reduced damage in crashes (settings defaults) - default pawns (50 -> 45), starting pawns (30 -> 25). - Added new option: fire multiplier. Can turn fire off. Except engine and shells. - Mod options moved to mod settings in the Rimworld options menu. - Recompiled for new version. - Disable Alien Nest in the starting event. Due to unbeatable bugs with new AI. - Fixed crash when migrating to new place. - Set category for all incidents. - Crashed Battery no longer appear in build menu. - Add a null check in furniture container code. - Weapon container can spawn stacks of items (like ammo from Combat Realism). - Fixed the crashed ship parts deconstruction time. - Code refactoring: All crashlanding events, like single part crash, can be used in scenarios and can be launched from dev mode. - Mod`s Fuel puddle behave like vanila fuel puddle. There are two custom fuel puddles now: an old one is used on swamps and water, a new one is more like vanila fuel puddle and is usen on land. - Fix some bugs with reactors radiation. -- Contraband cargo container. It hold drugs. -- Alien pod. Hive and bugs. -- High Tech module. Component assembler and high tech research bench. And components. -- Resource container quantity is now based on item cost. No longer tons of super valuable resources. But art can still be very valuable. -- Domesticated animals pen can bring cows, chickens and other animals with wilderness <0.1. -- Domesticated animals pen holds some kibble. -- Survived spacers from random ship crash will leave the map. -- Added animal products to the food container. -- More components in some parts. -- Simple ship part will leave ship chunks. -- Crashed batteries can be uninstalled like vanilla batteries. -- Weapon deck new contain mortars and turrets. -- Rebalanced Big Ship parts probabilities. - Fixed wrong pawns faction after loading the saved game. - Fix prisoners recruit chance value. - Savegame compatibility with previous version (7.00). - Scenarios added. You should start the new game with one of the CrashLanding scenarios. Modes are gone. - Fix: Do full crash damage to Animals. - Minor Refactoring: Remove easy and hard modes. - Rebalance for crashed ship parts deconstruct resources. Components added. - Fixed a bug with Reactor causing exceptions. - New ship part: Domestic Animal Pens. - New option in OptionDefs: fillStartColonistsBlock - controls the number of colonists in starting cryptosleep block. - Renamed Textures and Languages directory. First letter in uppercase. - If there is no prisoners faction in the world (old saves and worlds), the prisoners should be generated for hostile spacer faction. - Added new random crashes... It is not what you thinking about. It is a new event, that can happen during the game, when different small spaceships crashlands near your colony. - Reworked parts generation algorithm. - Created templates for crashlanding events. Templates are used for parts generation and located in CrashLanding\defs\CrashTemplateDefs\. You can now adjust, how parts are generated in starting event and random events, and even add your own templates for random crash events. See description in corresponding xml files. - Added a new ship part: Trade goods container - it contains a mixed type of goods. - New option in OptionDefs: partsTimeDelayMultiplier - controls the time delay between ship's parts falling. - Old option is removed: dangeroustPartsChanceMultiplier - since there are crashTemplates, and this option is not needed anymore. - Removed all vanila replacements except MapGeneration. This will lower the chances of mods incompatibility. - Reduced the crash damage to starting colonists. You should now have a capable colonist at the game start, however it is still random. It is a necessary measure, because a new generation algorithm is truly random, and the next cryptosleep block can only fall at the end of crashlanding event. 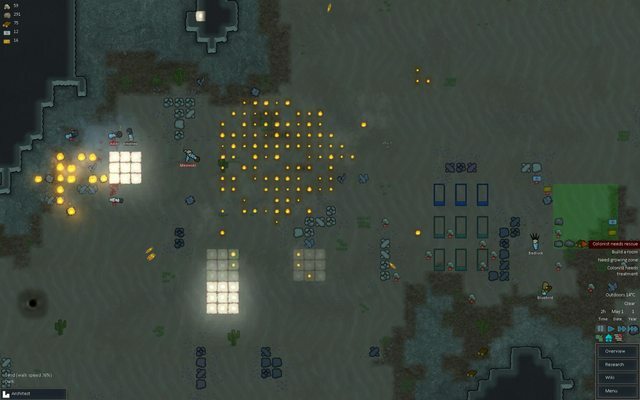 - Prisoners and crashlanded pirates are now attack colony. - Corpses apparel new get damaged by radiation, like on living pawn. - Reworked drop from containers algorithm. - Reduced hitpoints of ship engine and ammo container. Increased their explosion occurrence chance. - Added some deconstruct descriptions for crashed ship parts. - Added a picture to mod description. - Fixed wasteland appear speed. It was mistakenly increased in V4.20. - Ship parts now randomly rotated during fall and have a smoke trail. - Additional options added to optionDef: dangeroustPartsChanceMultiplier, crashlandedPawnsDamage, crashlandedStartColonistsDamage, colonistPerBlockCount. See optionDef.xml for more description. - Adjusted item generation and prisoners. - Radiation state shows lethal percent. - Radiation damages worn apparel. - Reactor has a button that creates an allow area outside of the danger zone. - Any apparel give some protection based on covered body parts. Torso +20%, legs +10%, head and ears +10%, eyes +10%, but full head gives you +50% total. That mean full power armor gives you 80%. - This system can work with any apparel mods, for example: gas mask from Apparello mod give you +50% since it cover full head, hazard suit from industrialization mod gives you 80%. - This system is not very realistic, but it works with any mod. - Reactor's radiation now damages plants, certain equipment and terrain. - New terrain type - wasteland. It is non fertile land, that is slowly generated by reactor. - Added ammo container, that appear after weapon deck crash. While on fire it will constantly explode with the rain of shells in a large radius. It works as old custom shells, that were removed in V4.0. - Added a missed russian localization. - Updated to Alpha 11. - No new content. Just update A10 version to A11. - Deleted shell modifications. They are become vanila. - Updated to Alpha 10. - No new content. Just update A9 version to A10. - Hard mode is available without EdBScenarios. In a hard mode, your colonists fall in a cryptosleep block like all others, and have a low chances to survive. That mean you will play with random colonists from different blocks, that are lucky to survive. <isHard> - difficulty or mode, true - means Hard mode, false - means easy mode. <disableRain> - set false if you dont want to force disable rain during the crash landing event. true - means that during the crashlanding event there will be no rain. - Fixed bug with Weapon deck not working. - Updated to Alpha 9. - No new content or fixes. Just update A8 version to A9. - Fixed a bug with spawning turret weapon in a weapon deck. Check (destroyOnDrop == false && canBeSpawningInventory == true) before spawn. - Set canFreeIntercept flag to bullets from weapon deck explosion. - Reduced fires during parts impact. The damage type of the majority of impacts replaced with Bomb type. Additionally, a few small fires appear. - New puddle fuel burns much longer, and raises chance of resource burning in locations without plants. - Fixed a bug with radiation damage does not kill colonists. - Fixed a bug with non spawning weapon deck, when certain mods enabled. - Updated to use EdBScenarios 1.1.1. - Russian localization for scenario descriptions added. - Learned about ExposeData. Save/load game should now work correctly. I hope. - Russian localization added. Except scenario description. - Radiation damage now slowly heals (about 3% per 5 days), instead of sudden disappearing after half year. - Fixed a bug with possible duplication of starting crash event. - Shell explosion chances adjusted. 50% nothing, 5% incendiary shell, 45% explosion shell for every item in stack. - Crashed ship beam deconstruction time reduced. - Chain explosions. Ship parts can now break apart on impact and fly some more to have another impact. Some parts can cause explosions while on a land. - Stuff crafted in EdB Prepare Carefully now also crashlanded in Hard scenario (EdB Scenarios needed). - You can now adjust starting colonists and stuff in a hard scenario, but you cant be sure that they survive crashland. - New pictures added to the scenarios. Thanks to [url=https://ludeon.com/forums/index.php?action=profile;u=35066]JoeysLucky22[/url]. - Letters about crashed parts are now have different colors. - Parts fall directions slightly random. - Random ship crash land should happen not more than once a year. - Easy. Works as ordinary. - Hard. Starting with random colonists, that crashlanded like all others. - This mod can work alone, as it was earlie. But no crashlanding for starting colonists. - Reactor still very dangerous, but get a new feature: It produces power! You can connect crashed reactor to your power net and get free energy. Of course, for a price of safety. Dont forget to remove home zone in the irradiated area. And be on guard, if your colonists decide to walk near reactor. - Not more than one AI Core and one reactor in single event. - Rain is now blocked only for starting Crashlanding Event, bun not for random one. - Two scenarios. You can change them through in-game editor, and they still be CrashLanding scenarios. - Settings, where you can adjust the mod to your taste. Disable Rain - set false if you dont want to force disable rain during the crash landing event. true - means that during the crashlanding event there will be no rain. Rain Delay - controls the time delay before the rain become possible. Multiplier for time delay between parts - controls the time delay between ship's parts falling. Damage to Pawns - controls the amount of damage dealt to the pawns during crashlanding. Damage to starting Pawns - controls the amount of damage dealt to the start colonists during crashlanding. Number of colonists in one block - controls the number of colonists in one criptosleep block. Fill the starting colonists block - controls the number of colonists in the starting criptosleep block. - Templates for crashlanding events. Templates are used for parts generation and located in CrashLanding\defs\CrashTemplateDefs\. You can now adjust, how parts are generated in starting event and random events, and even add your own templates for random crash events. See description in corresponding xml files. - Rain is disabled for the duration of the event. Your colonist should beat the fire on their own. Can be enabled in OptionDefs. - Fixed event texts. But still some texts with mistakes due to my bad English. 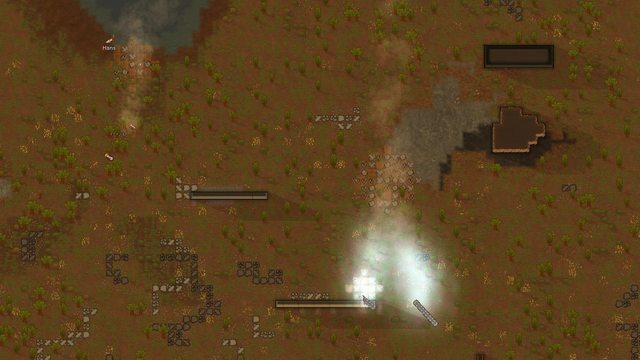 - Updates to newer versions of rimworld. - Make hard CrashLanding scenario work with EdB Prepare Carefully. It should be compatible with everything with a few exceptions. Sometimes new items from other mods could not properly appear in cargo containers. EdB Prepare Carefully does not work with Hard CrashLanding scenario. But does work with easy one. As for NoDisableRain variant. It does not needed anymore. Because there are mod options that can enable or disable it (see contents). As for EdB Prepare Carefully variant. It does not needed anymore. Easy crashlanding scenario is compatible with EdB Prepare Carefully. - Select scenario: CrashLanding Easy or CrashLanding Hard. - You can use CrashLanding mod in your modPacks. You can make a compatible patch if necessary. - You can use source code of CrashLanding mod to create your own mods. Just add a reference to this mod. Question: Will your original colonist selection be affected by the crash landing (will any of them turn up dead? ) or are additional pawns spawned for the effect? Starting colonists are unaffected. But im working on it. Now, a new colonists spawned in a crash landing parts. Why did you decide to disable rain? Shouldn't that be part of the random natural story that develops? Because i think that its not really random. Every time you have many fire things on a map, the rain starts. If i dont turn off the rain, it will certainly start after a couple of falled parts. You may check, that after the crashLanding event ends, the rain starts during the next 24 hours. I guess that made for stopping the fire from destroying entire map. So i force stop the rain, that force start due to major fire on the map. But, may be you right. I should stop rain only for starting event, but not for random space ship crash. I also don't like the idea of a force-stopped rain. Anyway, this mod is among the most favourite ideas I've seen lately! Can't wait to try it out. I agree, the rain is not random at all. After the event was finished for a while, there would be rain. 10 days later, the forest will obviously heal itself. Steel is food. Steel is defense. Steel is weapon. This is actually simple and cool mod!I was always thinking about why my refugees fell without a scratch.But other refugees are spawned as wounded?And cargo is cool too. I really like the idea for the mod! Looks really cool :-) I have just some observations on rain after fire. From my experience, too much fire makes the game drasticlly slower. I experienced that few times with TTM meteors, that when one eight of map was burining the game was almost dying on my computer. For me the rain always seemed to be a simple mechanism that permits playing the game on a wider range of machines. Without the rain starting in case of a too big fire, the game is pretty much killed for people who have not bought a more powerful machine aimed for gaming. It becomes too slow to do anything, including fighting with fire. Therefore, it seems to me that the rain after fire is a balance mechanism, that makes the game go smoothly on larger variety of computers. So it all depends on for how long you have disabled the rain.